Why it has taken EMI so long to release Boult's penultimate recording of The Planets, I have no idea. It may be because EMI has already released two of Boult's recordings of Holst's masterwork onto compact disc. Boult recorded this work no less than five times, three alone for EMI and once for Decca and once for Westminster. Each version of the work is distinctive and well worth hearing but it is his final EMI recording from 1979 in late analogue sound that has been the favorite of most critics. It is certainly his best recorded and probably best played performance (although the BBC Symphony in Boult's EMI 1944 recording plays quite stunningly) but I have always found this New Philharmonia recording from 1966 to be the most magical of all Boult's Planets, indeed I can't think of a single recording among the legion that have been made of this work that is superior. The field is intensively competitive when it comes to The Planets. Star conductors who ignore Elgar, Vaughan Williams and Britten have added The Planets to their repertoire and bad performance of The Planets have been relatively rare. Some recordings suffer from being bland (Previn's Telarc remake) or slick (James Levine and Herbert Von Karajan both on DG). My least favorite recording is the bizarre and plodding Phase 4 Decca recording made by Bernard Herrmann. Stokowski's EMI recording from the late 1950s is, well, Stokowski. It's a poor representation of Holst but a fascinating document of how Stokowski could shape (and sometimes distort) a work to give it his distinctive sound. The approach taken by most British conductors has been comparatively straight and this has often resulted in very fresh interpretations including those by James Judd on Denon, Sir Alexander Gibson on Chandos and Vernon Handley on Tring. My three favorite non-Boult recordings are, however, by non-Brits. The Previn EMI from 1974, the Haitink Philips from 1971 and the Dutoit's Decca 1985 have just that extra amount of personality to set them apart from the competition. Some may question Haitink's choice of a very slow and steady tempo for Mars but no one can deny its impact or the dedication of the music making. For authenticity, most listeners turn to Boult or Holst himself. 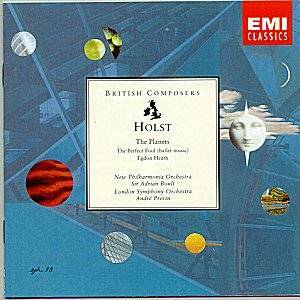 Holst's two recordings of the work are interesting but not satisfying musically. Whether that's because of the primitive conditions under which the recordings were made or Holst's inabilities as a conductor is unknown to me. His performances sound too perfuntory for a work loaded with such brilliant color. Boult studied the work with Holst and I assume his recordings are the most faithful representations of all. Among his five recordings, only one is less than great. His recording for Westminster suffers from some indifferent orchestral playing. There is nothing to fault in his BBC recording except, perhaps for the very good but still archaic 78s mono sound. Boult's final recording with the LPO is the best recorded and contains an absolutely shattering interpretation of Mars as well exuberant interpretations of Jupiter and Uranus. Where this performance falls flat, in my opinion, is in the comparatively rushed accounts of both Venus and Saturn. Venus is taken at such a swift pace that it could almost be mistaken for Mercury and the closing pages of Saturn are not as contemplative or calm as the music requires. the work truly never ends. But it is Boult's performance of Saturn that distinguishes this performance from all others. The opening tread of those flute and harp chords is slow and absolutely bone chilling. Boult creates a mood of dreadful expectation. The works continues its inevitable dissent toward that horrific climax with a tempo that is steady and unrelenting. Those tinny bells and brass clang out with tremendous force and all seems death and decay until the music gives way into music of profound peace and resignation. Boult's approach is dead-serious and it is his obvious dedication that convinces more than in any other recording that this is great and deeply profound music. The Planets occupies a strange place in British music. It is the only "hit" score by Holst. Its overwhelming success at the expense of his other music has given the impression that Holst was a "one-work" composer. This is emphatically not the case and the compact disc has helped to change that impression. The extra playing time allowed on the CD has meant that each new recording of The Planets has had room for a companion which, more often than not, has usually been another work by Holst. This particular disc includes one of Holst's most exhilarating scores, The Perfect Fool ballet music along with that great masterwork of British music, Egdon Heath. These are Andre Previn's recordings from the mid '70s and they sound astonishingly fresh in this transfer. Previn has great feeling for both works and indeed, you are likely never to hear a more desolate sounding Egdon Heath. Boult on Decca and Lloyd-Jones on Naxos are perhaps better at moving the music along while at the same time maintaining that the same foreboding atmosphere. Nevertheless, Previn exhibits much the same seriousness of purpose and dedication that makes Boult's recording of The Planets so unforgettable. This is the recording I would recommend for The Planets and the inclusion of two beautifully played Holst rarities makes it all that more indispensable. Plus you have Sir Adrian's own notes on The Planets that accompanied the original LP.